Back in mid-November, UHD titles on Google Play began rolling out, but at last, Google has made the move official. Back when titles were slowing hitting Google Play, we could only find a handful of films offered in UHD, but now, Google states there are more than 125 titles to choose from. Now, while no one can argue against higher resolution, the price for some of these movies is pretty crazy. For example, you can grab Tom Hanks and Clint Eastwood’s latest, Sully, for $29.99. Same goes for Suicide Squad. Other titles, like Everest, are a tad cheaper at $24.99 for the UHD option. At least from my quick glance, Google isn’t listing all of the UHD titles in Google Play under its own category yet, but I assume one is incoming. I’m not here to argue for or against UHD and its pricing, so I’ll let you all do that in the comments below. 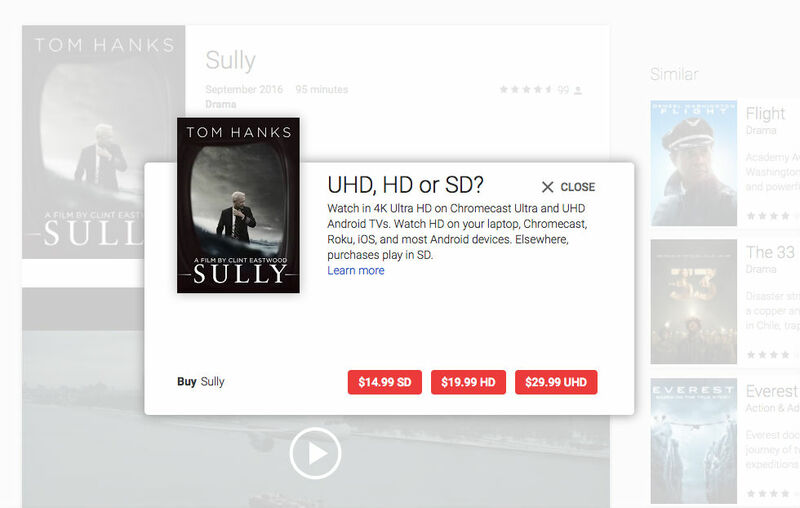 However, for anyone who purchases (or has purchased) a Chromecast Ultra, Google is hooking you up with a free UHD title rental.